This week the famous Taiwan-based tech company Acer has announced the launch of its new S1 Series LCD displays the diagonal of which ranges between 18.5 inches and 23 inches. An impressive feature is the thickness of the new full HD LCDs, measuring from 13mm to 15mm. The S1 Series includes four models that provide a contrast ration of 12,000,000:1 along with a 5ms response time. 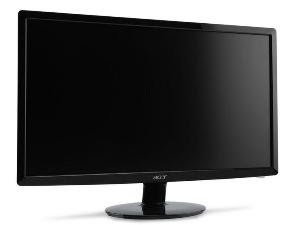 In addition, the new LCDs, just like most widescreen LCDs from Acer have a very attractive design. It is worth mentioning that Acer is a company that keeps to its environmental credentials, carrying on with its EcoDisplay campaign. Each LCD from Acer includes a logo that indicates low-environmental impact. Just like its other displays, the new LCDs from the S1 series boast low energy consumption and are made using eco-friendly materials. The four models from Acer feature VGA and DVI ports with HDCP encryption, which makes it possible for the user to watch all of the acquired HD content. But an HDMI port is only available on the 21 and 23-inch models.